Barbados Aloe is a clump forming aloe that is a major source of the aloe used for medicinal purposes. Aloes are native to Africa, and various species occur their respective regions in southern Africa, the mountains of tropical Africa, various islands off the coast of Africa including Madagascar, and on the Arabian Peninsula. The grayish green waxy leaves grow in a rosettes, with leaf margins armed with whitish to reddish teeth. The leaves can grow to two feet in length. 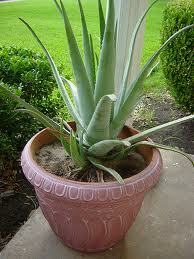 Aloes make excellent houseplants and are very easy to grow. In our area that can be grown outside in the summer and brought inside before the first frost. They are hardy in USDA zones 9-12.
waterings. Fertilize only once during the growing season with a balanced fertilizer. You can propagate Aloe by culturing offshoots or by seed when available. Come check out our new shipment of Aloe plants at the nursery.